Unemployment has become a serious threat to junior doctors, the British Medical Association has warned. It said intense competition for posts had left many without jobs to go to when their contracts end next week. In a letter to Health Secretary Patricia Hewitt, the BMA said many junior doctors were considering leaving the country or quitting medicine. The Department of Health admitted competition for posts was fierce, and said it was reviewing the situation. The BMA said the number of places at medical school had increased and applications from overseas were rising - but the number of postgraduate training posts had not increased at the same rate. At the same time, many jobs have been phased out as a result of the introduction of a new training structure. The government has said there has been no reduction in numbers of Senior House Officer (SHO) posts - the middle training grade for doctors. But the BMA said the number of SHO jobs advertised in the British Medical Journal - by far the main source of such adverts - fell by 50% between May 2002 and May 2005. On average, more than 200 junior doctors apply for every training post, with some jobs attracting over 1,000 applications. Mr Simon Eccles, chairman of the BMA's Junior Doctors Committee, said: "The situation is far worse than anyone expected. "We keep hearing from doctors who've been turned down for hundreds of jobs and now have no idea what they're going to do. "It makes no sense that at a time when the country is short of fully trained medical staff, we're pushing doctors into unemployment. "It costs around a quarter of a million pounds to train a doctor to this level. A lot of talent and taxpayers' money is going to waste." 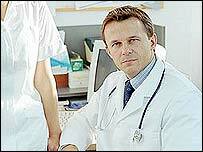 The exact number of doctors who have been unable to find a job is not known. But more than one in three of the 276 first-year doctors who responded to a BMA website survey said they had not been offered a post to start next week, and many more experienced doctors have also been unable to find a job. Nearly six in 10 (58%) said they would consider going overseas to continue training, and one in three said they would consider leaving the medical profession altogether. The BMA has called for the government to address the issue by expanding numbers of doctors in higher specialist training. A Department of Health spokesperson said the issue was under close review. There had always been healthy competition for SHO posts, the spokesperson said, but the number of applicants had risen this year. This might mean that some doctors would not be able to find a SHO post in their first choice of location or specialty. "We highly value our home grown doctors in whose education and training we have invested heavily, and recognise that they have made a significant commitment to the medical profession and a future career in the NHS. "We want these doctors to progress and develop their careers in the NHS where we see them as the doctors of the future, delivering modernised, patient-centred services." But Andrew Lansley, Shadow Secretary of State for Health, said: "It is crazy for hundreds, perhaps even thousands, of recently qualified doctors from overseas to come to the UK looking for training posts; with the result that UK qualified doctors may fail to get training posts."